Almost a year ago I've got really interested in MyRocks and built MySQL from Facebook that provides it from source. Since that time I build it from fresh sources few times per week (as I've described in that post) and once in a while try to work with it and study some details or use cases. Today I'd like to discuss one of them that I've recently studied with perf profiler. This may change when MyRocks builds from Percona or MariaDB will appear as ready for common use, but for now perf is a way to go, and I like it! for the famous use case presented in Bug #68079. Scalability problems identified there cause a lot of work by Oracle engineers, and a lot of changes in MySQL 5.6.x and 5.7.x (so natable that MariaDB decided to use only those from 5.7 in the upcoming MariaDB 10.2, see MDEV-10476). 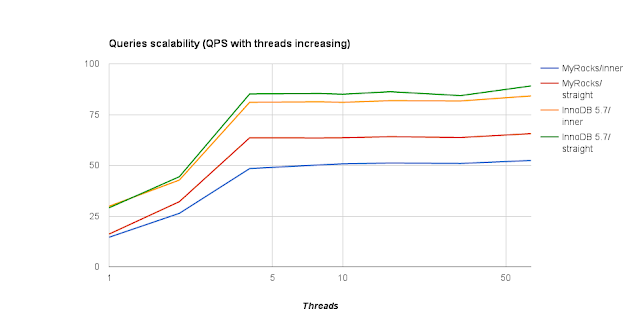 I've already mentioned this bug probably in every my public talk about MySQL since 2013, so one day I decided to check how the fix helped for recent InnoDB and then compare to MyRocks performance with all default settings on the same hardware for different number of concurrent threads. with different --concurrency values: 1, 2, 4, 8, 10, 16, 32 (on a box with 4 cores). Before the fix InnoDB had scalability problems even with concurrency N, where N is the number of cores. After the fix it scaled way better in this test. 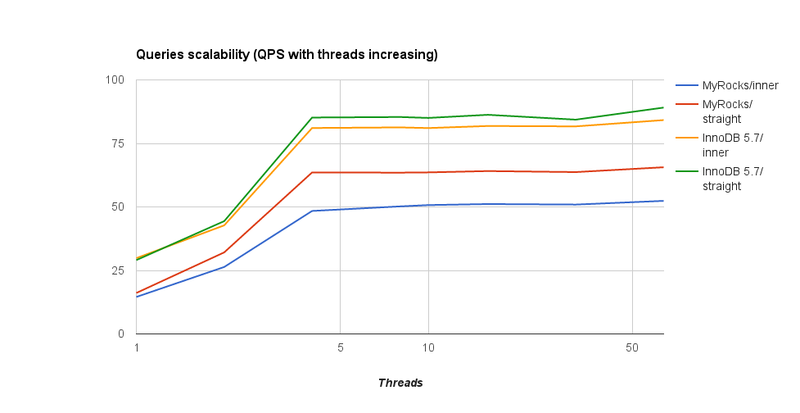 The X axis has log scale and shows number of concurrent threads running. The Y axis is the average number of problematic queries executed per second. "inner" and "straight" refer to INNER JOIN vs STRAIGHT_JOIN queries presented above. Profiler was started, then mysqlslap command executed and Ctrl-C was pressed when it produced the results. I am not an expert in MyRocks at all, so I will not even try to interpret these results (maybe in some later post, one day. I've just highlighted what I consider a real difference in the second (INNER JOIN) case. Note pthread_mutex_lock/pthread_mutex_unlock calls, for example that are NOT present in "more than 1%" output for STRAIGHT_JOIN case. I'd be happy to get any comments on the above. I also plan to share more/raw data from perf some day later, when I decide where to put them for public access (we speak about text outputs megabytes in size). Again, full trees are huge and require real expert to be analyzed properly. that show how data are read in MyRocks. You can get similar backtraces with pt-pmp as well, but you'll see only how many times specific backtrace was noted, not what was the related overhead. Also, performance impact from pt-pmp would be very notable in this case. Time to stop it seems, the post is already long. One day I'll continue, as there are many phenomena highlighted by this very simple, but famous, use case. Stay tuned! Oprofile was widely used for MySQL profiling on Linux in the past. But since 2010 and 2.6.31 Linux kernels another profiler, perf, gets increasing popularity. It uses performance counters (CPU hardware registers that count hardware events such as instructions executed) subsystem in Linux. perf is capable of lightweight profiling. It is included in the Linux kernel, under tools/perf (so features available depends on kernel version), and is frequently updated and enhanced. So, probably perf is the future of profiling on Linux and it makes sense to discuss its basic usage for profiling MySQL servers. For detailed discussions of features provided, numerous examples (not related to MySQL) and links I suggest to read great posts by Brendan Gregg, starting from this one. On RPM-based systems package name is just perf. I plan to discuss and show details of (other versions of) perf usage on CentOS 6.8 and Fedora 25 later. Also, ideally binaries that you are profiling should be built with -fno-omit-frame-pointer option. As in the previous post about basic oprofile usage, I'll try to start with a primitive test case based on Bug #39630, for simplicity and to establish basic trust in the tool's outputs, but this time I also want to try profiling some concurrent load more close to a real life, along the lines of Bug #83912. So, system-wide profile provides the information we can trust, even on multi-core systems for multi-threaded programs. If you know some other way, less intrusive way to get profiles that do not miss the details from threads running on other cores, please, tell me. I was NOT able to find it quickly. Press 'q' to get out of that screen. But we clearly see backtraces/callgraphs. I'd like to conclude this blog post with profiling system running test load presented in Bug #83912 (that, in turn, is just one of the observations based on a very complex real life performance problem I am still working on). There we run N+2 long running UPDATEs on N+2 different tables on a system with N cores. While UPDATEs run, sometimes SELECT asking for a single record by PRIMARY KEY for a different table may sometimes run slow, for fractions of second to many seconds. I am not surprised to see aes_encrypt in kernel on top of this system-wide profile, as encrupted HDD is used on this netbook (one of Percona security requirements for any hardware ever used for work, even personal) and upodates are surely I/O bound with mysqld --no-defaults and 128M of buffer pool. It spends 71.7% of time waiting to join InnoDB queue (in this limited InnoDB concurrency case) while diving into the index while optimizing the query... This time is spent on "statistics" stage, for single row SELECT by PRIMARY KEY. Now, go conclude this without a backtrace of calls or some profiler.